This GE Report is written by Julian from Microsoft. People’s Square Toastmasters Club 090707 meeting. The center aisle is a little crowded with the camera there. If the camera is not in use, it might be better to take it away. Keep your stories and comments focused. Its good that you make reflections and comments about what people had to say, but take it a step further and use what was last said to transition into the next topic. Keep transitions smooth, don’t say the same sentence, or use the same structure twice. After asking the person to come up to the stage, don’t say anything more until they take the stage. Wait for them to come up, don’t go off the stage of to the side to meet them. Good acronyms. ‘SS’ Simple Structure ‘PREP’ Point, Reason, Example, Point. Good use of PREP structure to give feedback. Specific examples are important. Good to point out good use of ‘vivid’ laguage. 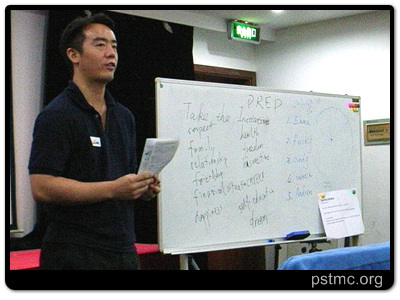 Good insight about ‘3 parts to persuade’, followed by examples of how speaker demonstrated each section. Good examples of how speaker used concrete proof with photos and statistics. Remember to discuss why good habits are important? Why do we want to connect with the audience? So that our messages have more impact and are received more effectively by the audience. Good explanation of Ah counters function, and why the role is important.